As a contributor to TES, I thought I’d share with you my most popular resource from the last 12 months. Hopefully they can be helpful to other teachers and save you some precious time. 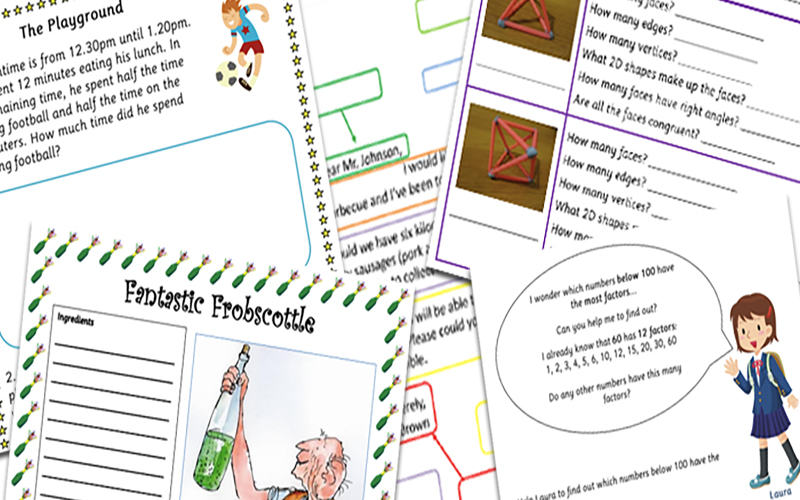 This pack contains differentiated worksheets for children to complete. Each worksheet contains photographs of 3D shapes that the children must construct then answer questions about their properties. This template allows children to ‘box up’ a traditional tale in order to make their own story. They can clearly see the main parts of the story then substitute in their own ideas and add further details. A template worksheet for writing newspaper articles. This worksheet consists of two columns with lines for writing on. There is a space for a heading and two subheadings. A space for a picture and caption is also provided. A great resource that can be used in a range of lessons. Three investigations involving products and factors. I laminated these so they can be reused with different groups. A set of 12 cards for children to choose from, each with a different word problem containing doubling and halving problems. A set of reading comprehension questions based on the Roald Dahl book, The Twits. Two differentiated booklets containing word problems that involve doubling and halving. Created while reading George’s Marvellous Medicine with a Year 3 class. I have included an example of a recipe for George’s Marvellous Medicine and a blank template for children to write their own recipe. This made some lovely display work. Whilst studying the BFG, I got my class to make their own Frobscottle using lemonade, ice cream and green food colouring. They then wrote up their recipes using these differentiated templates. Two worksheets where children can identify the features of a letter. The worksheet for the lower ability children has a word bank to aid them in labeling the features. The highest ability children could identify and colour the features of a letter then create their own key.